Scotland's indigenous population included two main groups of people: the Picts, a confederation of tribes that lived to the north of the Forth and Clyde rivers, and the Britons, a Roman-influenced Brythonic Celtic culture living in the south and along the central Borders area. Iberian Gaels from the Irish kingdom of Dál Riata penetrated Scotland and Britain towards the end of Roman occupation, further contributing to the land's ethno-linguistic mixture. The Romans termed these people "Scoti," named for the wife of their legendary founder. Gaelic royals brought with them the Stone of Destiny, the sacred seat on which all future monarchs of Scotland would be crowned. After the Romans left the Britain, the Gaels continued to extend their influence across the Isles. In 500, King Fergus Mor of Dál Riata conquered Argyll and the western isles, establishing a Gaelic stronghold in Scotland. 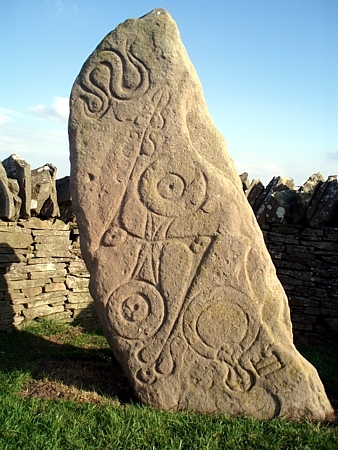 As the Gaels conquered Pictish lands and intermarried with Pictish people over the next two hundred years, Gaelic language and cultural practices slowly replaced Pictish traditions. 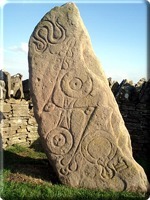 The Gaels also reintroduced Christianity to the Picts. Saint Ninian had first delivered the Gospel to the Picts in the 4th century, but they returned to worshipping their native gods in the century after his death. In 563, St. Columba, a Gaelic missionary from County Donegal, Ireland, established a monastery on the island of Iona in Dál Riata to begin a mission of evangelizing the Picts. When he visited the court of Bridei I of the Picts in Inverness, the king converted to Christianity and granted the missionary permission to spread the gospel throughout his kingdom. Columba served as a close advisor to the King of Dál Riata, and acted as a diplomat to the king's neighbours in Pictavia and Ireland. The monastery's influence continued to grow through the 7th century as Columban monks established more monasteries in Ireland and continued to spread the gospel throughout Pictavia, bringing with them classical art and education. By the close of the 6th century, Scotland was comprised of eight different provinces and kingdoms: thus began three centuries of war and reprisals. Gaels and Picts were now faced with a new threat brought by the Teutonic Angles from the Continent who began to colonize Scotland's southeastern plains. In 794, Norse Vikings raided the holy island of Iona, marking the beginning of a period of colonization of Scotland's northern shores and islands. This mixture of peoples wrought considerable changes in Scottish life, and set the foundation for Scotland's future ethno-linguistic makeup.